The top Madeira highlights are it’s stunning nature and eternal spring. 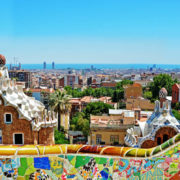 Hike the thousand of miles of hiking trails, summiting spectacular peaks and following ancient water irrigation channels. Then jump into the cobalt blue waters for a quick dip or catch a ferry to Porto Santo, a nearby island for with pristine white sand beaches. Break for tasty meals and plentiful local fruits. Check out the Travel Honey MADEIRA PHOTO GALLERY and 5 DAY MADEIRA ITINERARY. MADEIRA HIGHLIGHTS, WHAT TO DO? Get to one of Madeira’s amazing viewpoints like Pico . If it’s your jam, get out and do some hiking. Most tourists in Madeira just go to the viewpoints, so if you get out and walk even a little bit, you’ll be rewarded with awesome views with a lot fewer tourists. Wander the streets of Funchal, especially old town. There’s nothing particular you “have to do” in Funchal but the gondola, Madeira wine tasting and riding a large toboggan down a steep hill (we’re not making this up!) are all popular. Our favorite thought is getting lost in its charmingly narrow streets. Walk along a levada. These irrigation channels snake all through Madeira and provide for awesome and usually not too strenuous hikes. Often to beautiful waterfalls. Visit a natural swimming pool. Even if the weather is cool and you can’t go in, they’re still cool to see. If you’re not scared of heights, visit Cape Girão, which is a cliff with stunning views and a see-through platform that allows you to see out and below! 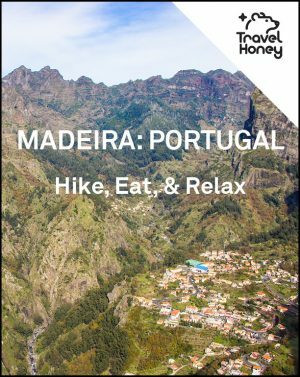 If you want to see more details on these activities and super helpful day-by-day suggestions, check out the Travel Honey Madeira itinerary. You’ll also get everything on an interactive Google Map, to help with planning and when you’re in Madeira! MADEIRA HIGHLIGHTS, WHERE TO STAY? Funchal is the largest city in Madeira, so stay here when you visit Madeira if you want the largest selection of hotels and restaurants. There are more tourists in Funchal, especially when the cruise ships dock, so stay elsewhere if you prefer to be away from the crowds. So a real Madeira highlight is staying in a small town like charming Ponta dol So. You’ll get the same quality but less expensive rooms. If you have more than a long weekend when visiting Madeira, then try both, Funchal and outside the city! Madeira hotels are more affordable than most other European countries. Although the summer and holidays are the high season, Madeira is known to have an “eternal spring”, so it gets visitors all year round. When you visit Madeira, it’s best to book ahead, especially the smaller boutique hotels. Most Madeira hotels, especially the nicer ones, include a breakfast with your stay. We’ve listed some of our favorite lodging ideas on Madeira Island (just keep in mind our pricing guide below!). If you want to see all these hotels on a map and links to real guests photos, it’s included with the Travel Honey Madeira itinerary. You’ll also get a day-by-day guide on the best activities to the best activities. Quinta Mirabela ($$$) Impressive views from the roof deck and pool. Just above Funchal center. Cosy beds. Quinta da Casa Branca ($$$) Romantic, five star hideaway just outside of Funchal. Castanheiro Boutique Hotel ($$) Elegant hotel with sauna and Turkish baths. Central location in Funchal. Estalagem Da Ponta Do Sol Hotel ($$) Contemporary, white hotel perched on top of a cliff and overlooking the ocean. About 20 minutes west of Funchal. Pure design bliss. The Vine Hotel ($$) Centrally located hotel in Funchal for wine lovers. Did we mention the a vinotherapy spa? Savoy Saccharum Resort & Spa ($$) Dreamy views of the ocean and great squash courts about 40 minutes west of Funchal. MADEIRA HIGHLIGHTS, WHERE TO EAT? Most Madeira restaurants are in Funchal but you’ll find some gems around the Island. Funchal’s city center is divided by streets that make a V-shape. To the east of the V is Old Town, which has narrow cobblestone streets. To the west, it’s not quite as charming, but there are some seriously good eats, so be sure to venture out of Old Town. Below is a list of tasty Madeira restaurants – some are good for snack or drink before dinner while others we recommend as a meal. Except for the places we suggest for lunch or a snack, you’ll need to make reservations if it’s the Holidays or if it’s the summer. If you want to see our full list of the best Madeira restaurants, with photos and more detailed reviews of each restaurant, a list of what to eat in Madeira, and all the highlighted Madeira restaurants on a map, it’s included with the Travel Honey Madeira itinerary. Risottoria Del Mundo ($$) All kinds of risottos (veggies, meat, fish) to your heart’s content. Faja dos Padres ($$) Traditional Madeira cuisine prepared with locally sourced ingredients. Only accessible by tram. Vila do Peixe ($$) Amazing pasta and fish. Gaviao Novo ($$) Come here for the grilled limpets served with lemon and garlic butter. Ritz Madeira ($) Best for people watching. Grab a coffee and a sweet. MADEIRA HIGHLIGHTS, WHERE TO GO FOR NIGHTLIFE? If you want nightlife, stay in Funchal. Because most of Madeira’s visitors are retirees from Europe, even in Funchal, the nightlife isn’t super happening. But that’s beginning to change as younger visitors are discovering this hidden gem of an island! Reid’s Place ($$) Stop by the Belmond hotel for a mellow nightcap or high end glass of wine. Vespas ($$) Clubbing to beats all night long. FX Sports Bar ($) Rowdy sports bar with good music. MADEIRA HIGHLIGHTS, BEST INSTAGRAM ACCOUNTS FOR MADEIRA? There are daily flights from Lisbon and London on TAP Portugal, British Airways and EasyJet. Madeira is about 2 hour flight from Lisbon and Porto and a 4 hour flight from London. HOW TO GET AROUND MADEIRA WHEN YOU VISIT? If you visit Madeira, rent a car because driving is the best way to go. Taxis are widely available, but avoid buses if you can– some routes are travelled just once a day. MADEIRA HIGHLIGHTS, WHAT’S THE BEST ITINERARY?